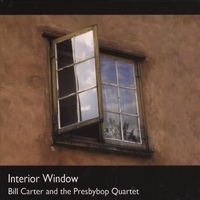 Since recording the "Interior Window" CD, Bill has had requests to develop the material even further. To that end, we are pleased to invite you to take part in an intriguing project for the season of Lent. It's called Lent and the Interior Window: An Online Jazz Retreat. For the 46 days of Lent (counting the Sundays), participants will be invited to draw on the music as a resource for personal reflection, prayer, meditation on Scripture, and action. We are excited about this project, which we have prepared with filmmaker Jeff Kellam. It brings the music to life - and lifts up the music as a helpful resource for deepening our lives. Exclusive opportunities to reflect on the spiritual practice of "audio divina," a meditative reflection on music. This online retreat goes live on Ash Wednesday (March 6, 2019) and continues through Easter (April 21, 2019). We are using an online learning platform from Ruzuku.com. The entire forty day experience is available for $29.99. Enrollment is now open. To hear Bill's introduction to the retreat, click here.